A pedestrian was fatally struck on Route 22 in Bridgewater. 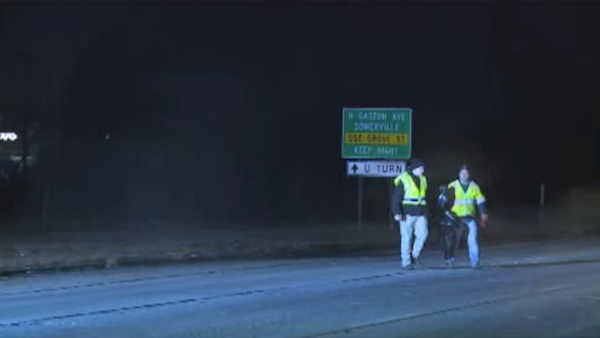 BRIDGEWATER, New Jersey -- A pedestrian was fatally struck on Route 22 in Bridgewater, New Jersey, the fourth pedestrian killed on that stretch of roadway since August. The victim was struck in the westbound lanes, just west of Interstate 287, just before midnight Sunday. Police say a 2015 Ford Mustang driven by 25-year-old Douglas Marino of Bridgewater was traveling on Route 22 West. The victim, who is yet to be identified, was standing in the center lane when he was hit. He was pronounced dead at Robert wood Johnson University Hospital in New Brunswick. Police describe the victim as an Hispanic male age 20-30, wearing black colored "Adidas" sweatpants, a black colored non-descript long sleeve shirt with a black colored "Nike" short sleeve shirt underneath. In August, two pedestrians were fatally struck running across the same roadway. Another pedestrian was killed in the westbound lanes in December. The crash is being investigated by the Bridgewater Township Police Department Traffic Safety Bureau and the Somerset County Accident Reconstruction Team.